This week was my first undertaking of preparing a vCenter environment for agent-less AV using Trend Micro Deep Security 9.6 SP1 and NSX Manager 6.2.4. So far, it’s been a great learning experience (to remain positive about it), so I wanted to share. So in anticipation of a “next time”, here are my notes from the installation and configuration. Hopefully, this information is found useful to others, as some of it isn’t even covered in the Deep Security Installation Guide. Please not, this is not a how-to. It’s more of a reference for the things we’ve discovered through this process that may not all be documented in one place. With that said, here’s my attempt at documenting what I’ve learned in one place. Deploy and configure NSX Manager, then register with vCenter and the Lookup Service. Deploy Guest Introspection Services to the cluster(s) requiring protection. Register the vCenter and NSX Manager from the Trend Micro Security Manager. Deploy the Trend Micro Deep Security Service from vSphere Networking and Security in the Web Client. When we first set out to deploy this in our datacenter, it was months ago. We initially started with vShield Manager, which is what was relayed to us from the team that manages Trend. We met with issues deploying properly and “things” missing from the vSphere Web Client when documentation said otherwise. We had support tickets open with both VMware and Trend Micro for at least a few months. At one point, due to the errors we were getting, Trend and VMware both escalated the issue to their engineering/development teams. At the end of the day, we (the customers) eventually figured out what was causing the problem… DNS lookups. The Trend Micro Deep Security installation guide does not cover this as a hard requirement. Although the product will allow you to input and save IP addresses instead of FQDNs, it just doesn’t work, so use DNS whenever possible! 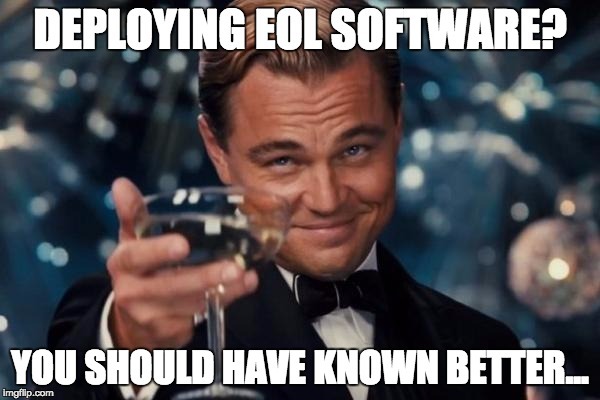 You don’t gain anything from deploying EOL software. Very importantly, you don’t get any future security updates when vulnerabilities are discovered and you won’t get any help if you call support about it. Endpoint would not stay installed on some the ESXi hosts, while it did on others. When deploying the TM DSVAs to hosts where Endpoint did stay on, installation fails as soon as the appliance is attempted to be deployed. This is where we discovered using FQDN instead of IP address is preferred. After successfully deploying the DSVAs, we still had problems with virtual appliances and endpoint staying registered, so it never actually worked. In the back of my mind since I didn’t do this up-front, I started questioning compatibility. Sure enough, vShield is EOL, and is not compatible with our vCenter and host versions. With a little more research, I found that NSX with Guest Introspection has replaced vShield for endpoint/GI services, and as long as that’s all you’re using NSX for, the license is free. With NSX 6.1 and later, there is also no need to “prepare stateless hosts” (see VMware KB: 2120649). Here are some tips to ensure a smooth deployment for NSX Manager 6.2.4 and Trend Micro Deep Security 9.6 SP1. Ensure your NTP servers are correct and reachable. When you first set up NSX Manager, be sure to add your user account or domain group with admin access to it for management, otherwise, you won’t see it in the vSphere Web Client unless you’re logged in with the administrator@vsphere.local account. Validate that there are DNS A and PTR records for the Trend Micro Security Manager, vCenter, and NSX Manager, otherwise anything you do in Deep Security to register your environment will fail. Pay close attention to the known issues and workarounds in the “Compatibility Between NSX 6.2.3 and 6.2.4 with Deep Security” reference above, because you will see the error/failure they refer to. If deploying in separate datacenters or across firewalls, be sure to allow all the necessary ports. Unlike vShield Manager deploying Endpoint, NSX Manager deploying Guest Introspection is done at the cluster level. When using NSX, you can’t deploy GI to only one host, you can only select a cluster to deploy to. If you’ve found this useful in your deployment, please comment and share! I’d like to hear from others who have experienced the same!